Recently my friend Milt Smith handed me a box of old "Fly Fisherman" magazines from the 70's and 80's that he wanted donated to the Foothills TU Hoot On The Hooch banquet coming up in March. He figured there may be some interest in them for a bucket raffle item and, besides, his wife told him to get them out of the house. Now, how many of us would consider the late 70's the good old days? It was 30 years ago but for some of us it seems only yesterday and it was about the time I decided to learn how to flyfish. So I took the collection home with me for safe keeping and one evening began leafing through some of the older issues. What a blast! I couldn't put them down. It was like I had been transported back in time as I thumbed through the mostly black and white pages. Nothing slick about these; not many steps above typing paper. But how interesting it is to read the advertisements. Two of the largest gear ads are for Pflueger and Martin reels. Rod manufacturers are just beginning to advertise graphite but they still off bamboo and fiberglass. Except for a two page ad touting "graphite's the standard now!" from Lew's Speed Stick fly rods. There is no Sage Manufacturing but you can order a Winston graphite trout rod directly from the factory for $175.00. They mention that they are so small (only four rod builders: Al Wilson, Glenn Brackett, Chris Warner and Tom Morgan all pictured sitting around the shop) that they can't service the fly shop market so you have to buy them from Winston. Fly lines were made by Gudebrod, Gladding and Sunset. You could buy a Hardy Princess for $47.35, and there were as many adds for bamboo fly rods as graphite; Payne, Leonard (who also made a graphite rod), Uslan, Weir & Son, and Phillipson. A letter to the editor was from a guy complaining about the high cost of waders at $45.00 a pair and you could only get one year out of them. 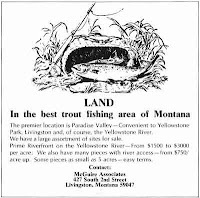 And the thing that most made me wish I could turn back the clock: Land on the Yellowstone River in Paradise Valley for $1500.00 per acre! Aaarrgh! Ahhh, the late 70s. Wait, I wasn't even born yet.